Take a look around a selection of our latest static caravans for sale that offer the quality, style and creature comforts to make your caravan a home from home. You can buy a new or pre-owned caravan through our flexible finance options available with a low deposit of 20% (subject to acceptance criteria). Here are a list of some of the reasons why we are proud of our Ownership opportunities at The Foxhunter Park. This stunning pre-owned Willerby Rio Gold is perfect for a family with its 2 Bedrooms. Enjoy staying here in your holiday home with onsite entertainment and fun by the pool. Contact the office today for more information. For more information on this beautiful home, Contact the office. 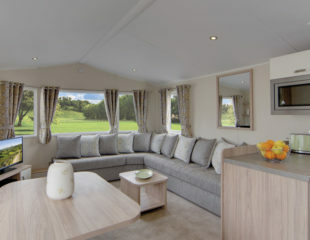 Our 30x12 ABI Summer Breeze is a beautiful caravan, Contact the office for a viewing before this bargain is snapped up. Our brand new to 2018 ABI St. David. Here at the Foxhunter Park we love the design of this caravan, these wont be on the showground for long so contact the office to view this beautiful caravan today. This is the holiday home to create memories in. Beautiful location on orchard 4. The upholstery is comprised of easy clean fabrics and modern spacious interiors provide everything a family needs for a relaxing holiday. Call the office today for more information on this lovely holiday home. There are a number of Lodges available for Holiday Accomodation. Please use the links below to view your preferred accommodation.